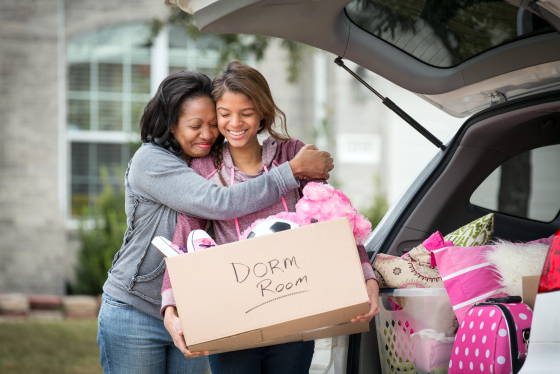 College is stressful and so is keeping your money safe. While I was attending, summer was the ultimate goal. “If I make it one more month, I get three months of freedom!” Then when those summer months came, there was so much funs stuff to do, but I realized I had no money—at least not enough to do what all of my college buddies did. My friends went out to clubs and concerts almost every night, went to Vegas and Mexico, and basically ran around like it was the summer before freshman year again. And me? I just sat around, worked a little, and longed for a vacation. I didn’t want to spend the little money I had in savings and I was always worried that I would lose my money or someone would try take advantage of my finances. Unfortunately, it wasn’t until after I finished school that I learned that I could have better enjoyed my summers. I may not have been able to hit all the clubs or blown money in Mexico, but I still could have had some cheap summer trips. I also could keep my money safe while going on trips. Growing up, I always looked forward to summers and the family vacations. Every year we went somewhere. It wasn’t always a trip to Disneyland or Six Flags, but often it was just going to a new city—Portland, Seattle, San Fran, Phoenix, Vegas—or going camping by a nearby lake. So after my freshman year of college, it was time for the big vacation, right? Wrong! I went back home to my parents empty house to spend the summer months rent-free…and was super bored. If this was how all of my summers would be, I was in for a long four years. The next summer I went back home to work and save up without having to pay rent again. I kept my savings in a safe so that I wasn’t tempted to spend my tuition. I took a summer job working for a freight company that I found through an awesome trucking site that my dad recommended. Not the idea I had in mind, but it worked. A few years later when I met my husband, I learned of this cool website, Groupon, which had many cool trip discounts to many destinations. My husband and I started to scheme was to make our own vacation cheap, affordable, and financially safe. My husband and I started to plan a safe and cheap vacation. You don’t have to spend a ton of money on vacations. You can keep your money safe and find alternatives. There are always cheap things to do close by for almost any college student sticking around campus. There’s bound to be a lake, some mountains to camp in, or a coast relatively close by. Depending on where your college is located, there are a number of cheap destinations you can find; mostly within the United States. My sister often went with her friends on a quick trip to Vegas over the weekend, but instead of dropping the big bucks on even the cheapest of hotels, they would camp nearby, saving hundreds of dollars! That’s a lot of slots to play! I also kept my money safe by buying a travel pouch that went under my shirt and by double checking debit card machines for a theft scanner before withdrawing money. My husband and I have taken a few small trips since we’ve been married and never pay more than a few hundred dollars total per trip! Most of the destinations could work for college students as well. We also take measures to keep our money safe in the Bank. We never carry more than a few hundred dollars (at most) on us. We also have the cancellation numbers for our credit cards programmed in our phones in case anything does happen. Sometimes it is hard to take nice trips after you have student debt from college. I am here to tell you that it is possible and there are safe ways to do it. After my husband and I consolidated our college debt we finally had some money to take some cheap vacations. Keeping local is one of the best ways to keep from spending thousands of dollars. Use the Groupon deals and find a cabin in the mountains, or a deal for a cheap hotel in a city you’ve always wanted to go to. But before you search for hotels, exhaust your best resource: family! Countless times we have crashed at a family member’s house for our quick trips. You probably haven’t seen them in a while anyway so it would be a fun time. Or go on a vacation with family or friends. That way if you do stay in a hotel, you can potentially split the price. Gas will also be split, saving tons of money. These last two tips work even better for college students than a young married couple because of a virtually endless supply of friends with family all over the country! You can stay at their parents’ house AND split the cost of gas! Even for poor college students, summer can be fun. You can also keep you money safe and go on cheap trips. Vacations (long or short) are a MUST for relieving the stress you were under for the last nine months and for making new friends and memories. I know that if I had known any of these ideas while I was still in college, I would have had a more enjoyable time. Take the appropriate measure to keep your money safe as well. Budget your money, never carry to much, use a hidden travel pouch, and always check for theft scanners before withdrawing money.